Are you thinking of engaging with social media for your healthcare brand? Are you a health practitioner or marketer who has already started with social media but you are not seeing the results you had hoped for? This week’s article will guide you through ten questions you should ask yourself before diving into social media waters. Whether you are a social media beginner or you have been using it for a while, answering these key questions will help guide your social media efforts toward success. Your healthcare marketing efforts will be stronger if you can identify your target market first. You can then tailor your content more specifically to match their needs. Unless you take this first step, your online activities will remain unfocused. You need to find the answers to basic demographic questions about your audience, whether they go online for research and what issues they are concerned with, alongside which communities inform, inspire, or influence your target audience. 2. Which social media platforms do my audience use? Armed with information on who makes up your audience, the next step is to determine which social media channels they use and direct your efforts accordingly. Most marketing efforts are focussed on the trifecta of Facebook, Twitter and LinkedIn, but visual platforms such as Pinterest and Instagram are also extremely popular. This doesn’t mean that you have to be everywhere at once. Not every healthcare brand belongs on Facebook, and putting effort into building an audience there will be wasted if your audience are predominately on another platform. So do your research in advance to determine where best to focus your social media efforts to be successful. 3. What do I want to achieve with social media? Do you want to increase awareness of the causes or treatment of a medical condition? Are you selling a health product or service and want to increase the number of buyers? Do you want to drive more traffic to your hospital website? Without clear goals in mind, you won’t know how to measure your social media effectiveness. It’s important to set social media goals that are specific, measurable, and achievable within a specific timeframe. For example, you might start off with a simple short-term goal such as “grow our Twitter followers by 10 people each week”. 4. What is my social media budget? There is a misconception that social media is completely free. While it’s true that it is free to set up an account on all the major platforms, most offer premium features which may be worth considering. In addition you might want to consider budgeting for some advertising to extend the reach of your message. 5. How much time can I give to social media? Time is another cost you need to factor in to the social media equation. To achieve results and credibility you have to be prepared to devote time regularly to producing and promoting content and engaging with your audience. 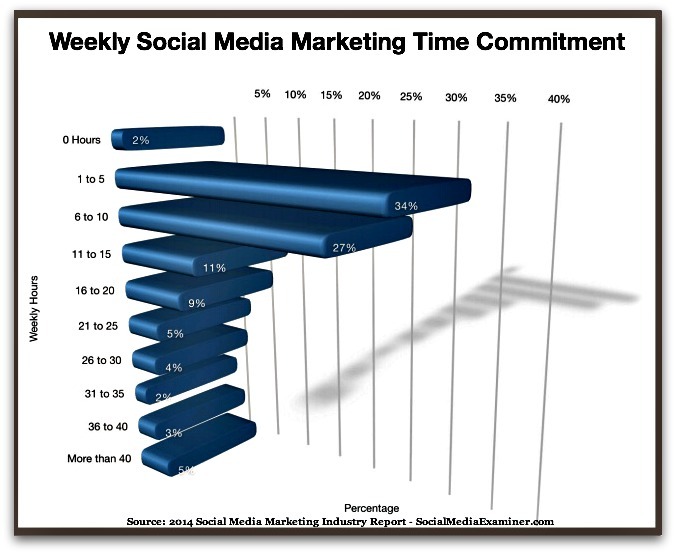 Take a look at this graph from a recent report by Social Media Examiner which illustrates the weekly time commitment of social media marketers. This should prompt you to ask how much of a time commitment can you afford for social media? Will you concentrate on just one platform and do that really well? Or do you need to hire some social media help? Tip: Consider scheduling your social media updates in advance. 6. What type of content will I create? Your answer to the previous question may influence the type of content you will create for social media. Do you have time to write regularly for a blog? Would it be better to make short videos for YouTube instead? You also need to keep in mind the content that works best on the platforms you have chosen. Facebook, Instagram and Pinterest require high quality visuals to stand out. LinkedIn on the other hand is better suited to industry news and thought pieces. They have recently incorporated a blogging platform which might be an avenue for you to publish health industry related content. (Read my guide to becoming a healthcare influencer on LinkedIn for more details). 7. What are my healthcare peers doing on social media? You can learn a lot by taking some time to observe what your peers are doing online. Which social media platforms do they use? What type of content do they share? How does their audience respond to them? What are they doing really well? What aren’t they currently doing that you could do well? 8. Who is the best person to handle social media? You may wish to take full responsibility for maintaining your social media presence, but if you are giving the task to someone in your organization, or hiring outside help, you need to ensure they are the right person for the job. That may sound self-evident, but often it is not the most obvious person who is the right person to handle social media. The people who are most successful on social media are not necessarily the most tech savvy; they are people with a passion for communicating and creating relationships online. Find that person and you will see results in the level of engagement and interaction from your online followers. 9. How will I monitor social media? From a marketing perspective, social media monitoring will help you determine the impact on your product, service or brand, and if required, make adjustments to your communication, marketing or sales plans. Responding in real time and resolving issues around your brand should they arise, strengthens public perception that your focus is strongly centered on patient satisfaction. If you have a brand name you need to track for mentions of the brand. There are many free and paid monitoring tools, with new services being added continually, which will help you track the metrics relevant to your brand across the web. The tools vary in scope and range across number of sites, real-time or delayed searching, sophistication of analytics, flexibility of data presentation, integration with other applications, and cost. Which one you choose will depend on your budget and the level of analytics you wish to achieve. 10. How will I measure social media? How will you know if you achieved your social media goals? To determine how effective your social media efforts are, you will need to measure your results. Measurement tools I recommend include Google Analytics (free), MOZ Analytics (free for 30 days) and KISS Metrics (free for 14 days). Some key metrics to track are the number of followers you attract and retain, what people are saying about you, your company, or brand, and which social media channels drive the most traffic to your website Social media metrics should alwyas be tied to your social media marketing goals and your target audience. Passive Medical Income While You Sleep?